With great pleasure The Spot asd and ACS Oasi Verde announce that once again Italy, and the city of Rome will host World Cup Skateboarding, the most important officially sanctioned professional skateboarding world tour. The event will be held from June 30 to July 3 2011. 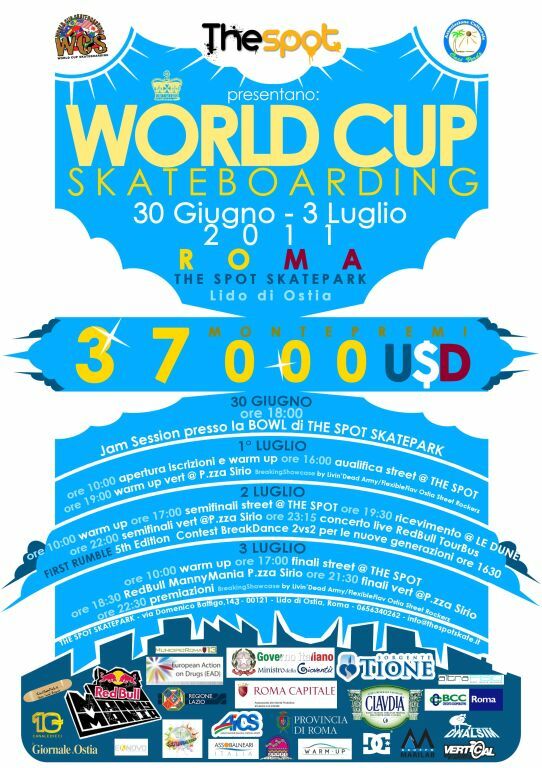 World Cup Skateboarding organizes overe 30 events in over 20 countries around the globe, and Rome’s eventi s part of the 5 top events (XGames Los Angeles, Maloof Money Cup in Sacramento, Bondi Beach Australia, Rome and Rio de Janeiro) that provide points for thr final standings. Besides, riders will compete for a fat slice of the €25000 prizemoney. Over 100 riders, men and ladies, from the 5 continents, will put up a challenge in the three “classic” freestyle competitions: “street” and “bowl” at THE SPOT skatepark in Ostia, and “vert” in the largest “plaza” on Ostia’s seashore, Piazza Sirio! Among riders pareticipating this year, “900 man” Sandro Dias (Bra) , and living legend of skateboarding Mike Vallely (USA). Many riders from southamerica will be flying in to try and replicate Milton Martinez’ success in 2008 and 2010 and Daniel Vieira, winner in 2009. Also, the best Italian riders! The presence of such a nice roster shows World Cup Skateboarding is by now a consolidated tour also in a country that has only lately started offering national riders the chance to compete in world level events and with world class riders. World Cup Skateboarding – The Spot Paradise is free for the audience. Saturday July 2 a free concert on board of RedBull Tour Bus (www.redbulltourbus.it). On Sunday July 3 Luglio, Piazza Sirio will host the national finals of RedBull Manny Mania, the worldwide contest of “manual” tricks. This year The Spot is proud to announce a new Partnership with the big Network Cineskatepark.it Main Media Partner of the event, enjoying wide consideration in Italy and abroad not only in promoting skateboard, but also involved in other street activities (graffiti and music). Innovation and many funcionalities will be used by Cineskatepark.it to follow and support all the events, providing live update, and new media means. Cineskatepark.it staff has set a new record in creating a new website for The Spot Skatepark (please click www.thespotskate.it), highly innovated to quench the thirst of our users and of all those who will click it. Other Important Media Partners, two big networks Radiorock, Canale10 TV. World Cup Skateboarding – Rhe Spot Paradise is supported by local and national authority. We wish to thank Ministry Of Youth, Province, City and XIII municipality of Rome, and our sponsors Redbull, Tione Acqua Claudia Froup, Bank of Credit Cooperative of Rome, DC Shoes, Le Dune Village and Assobalneari. The event will avail itself of the cooperation of Coloriamo i Sogni Onlus (presided by star actor Raoul Bova), Vertical Ramps of Switzerland, Association of Italian Culture and Sports, EX Novo COMMUNICATION and Warmup Cars. Medical and physiotherapic personnel onsite, thanks to Marilab and Altrafisio. All this said, we hope that our huge effort will be repaid by high numbers of Italian riders. World Cup Skateboarding – Rhe Spot Paradise is a chance for challenge and fun, but first of all a chance to display our vital, credible and talented scene.